The branded PrimaLoft® ThermoBall fill adds almost no volume to the jacket yet ensures the top level of heat insulation. 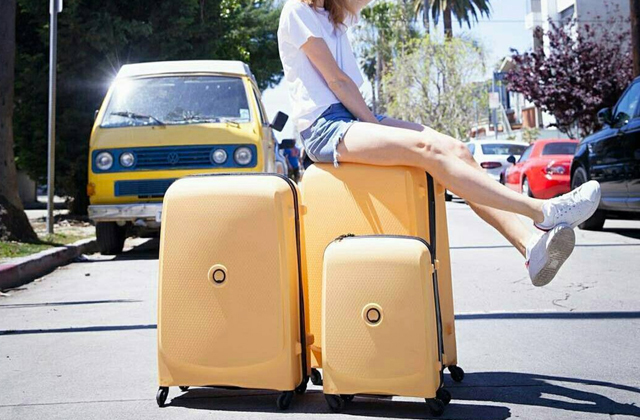 For a user's maximum convenience, the whole thing compactly packs into its own hand pocket so you can neatly tuck it away. There are no inside pockets. 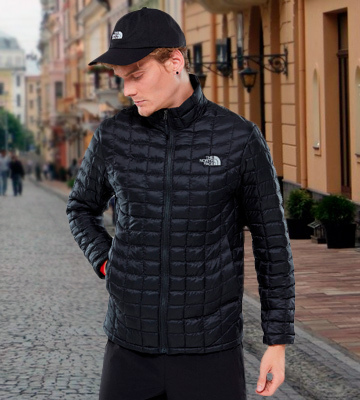 A winter jacket from a popular and reputed The North Face brand will make your walks in the moist and cold weather as comfortable as it gets. A stitched design will add style while a straight cut will ensure a free natural fit for any body build without limiting movements. It's a great choice for temperatures that don't fall far below 32 Fahrenheit. To achieve maximum comfort, you can adjust the hood size, detach the hood or remove only a fur ruff. Meanwhile, inner knitted cuffs will provide additional protection from the cold and wind. Upper chest pockets are somewhat inconvenient. Created by an active outdoorsman, the Eddie Bauer outerwear is the best for active people. Providing a fit that is neither too slim nor too loose, this parka will make you feel comfortable in any winter weather and even when going for some winter sports. With that, waterproof and breathable nylon will keep rain, sleet, and snow at bay. Wearing this jacket, you'll be guarded from the harshest weather conditions thanks to its excellent water-repellent qualities that do not change even under 10,000 mm pressure head. At the same time, the jacket is breathable due to the inner adjustable powder skirt, which means it won't make you sweat. You might even feel hot in this jacket during hard all-day skiing. 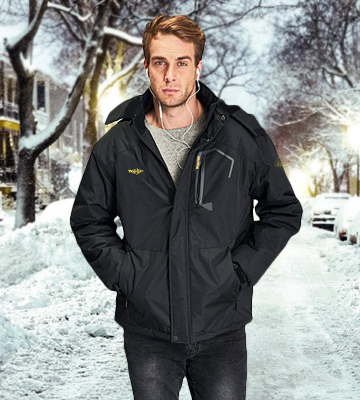 Designed for skiing, the Wantdo jacket will work just great for all kinds of winter sports and outdoor activities such as snowboarding, skating, mountaineering, winter fishing, etc. Made of weather-resistant materials and fitted with multiple convenience features, it will deliver the ultimate comfort to any active lifestyler. Soft plush fleece lines up the interior of not only the body area but also the collar and hood. Elastic cuffs and drawcords in the waist and hem, along with a sewn-in hood, will securely protect you from nasty weather. The design might appear looser than you expect. This model from Boulder Creek was specifically designed for larger and taller men who want to feel comfy during long winter outings or when heading somewhere on a chilly winter day. Distinguished by classic design and top-quality materials, it will keep you toasty throughout sever winter colds. 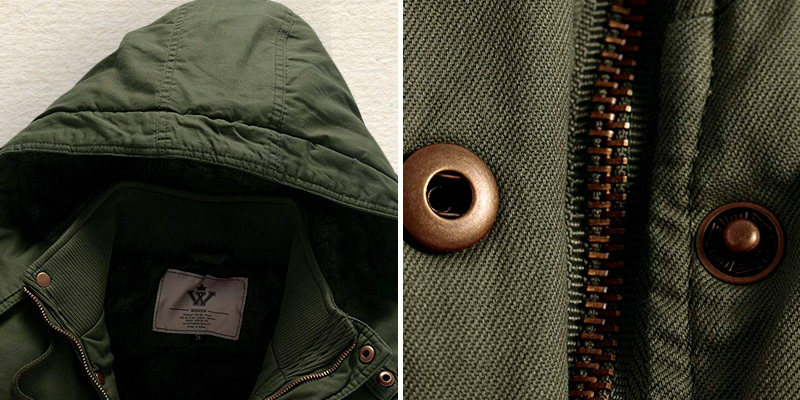 Unlike many other cotton parkas not so much suitable for sub-zero temperatures, this model will perfectly fight cold. 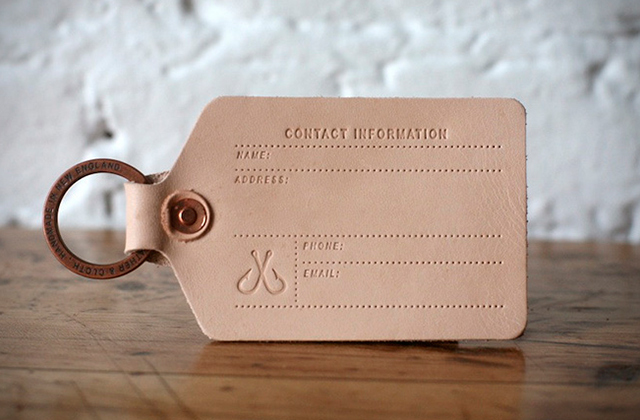 All of this is owing to a well-thought design with a thick fleece lining and a number of heat sealing details. It might seem somewhat heavy. Classy and warm, this winter jacket is suitable both for everyday wear and for outdoor activities. It will perfectly match a casual look and add a retro flair to a two-item business suit. A jacket that will suit most anyone. The North Face is one of the most popular and highly trusted American brands of outerwear and warm clothes for a cold season. The manufacturer is well-known for top quality and the ultimate practicality of its garments. The Men’s Thermoball Full Zip Jacket is not the newest model in the range, yet, it remains a favorite of consumers. Let's check out what makes it so popular. Owing to a quilted design, it looks like a down coat. However, it is not a down coat. 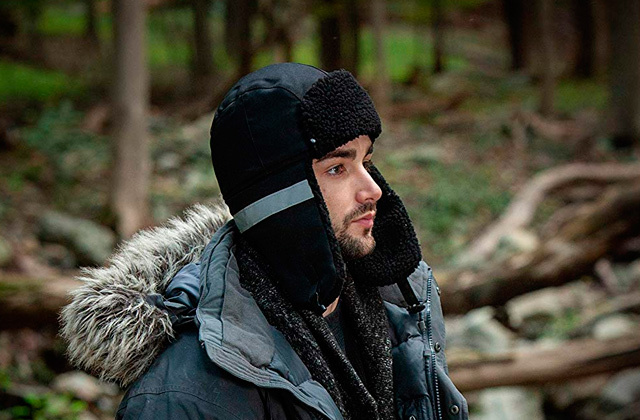 Instead, it features the branded PrimaLoft® fill, a polyester that emulates duck and goose down. 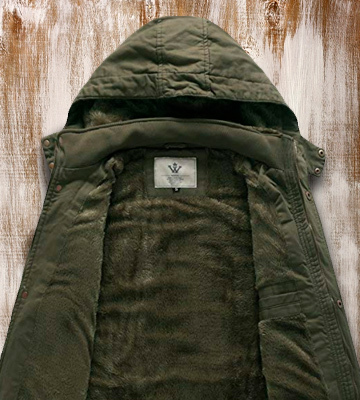 It gives almost no added volume to the jacket and efficiently traps warmth to provide high level of heat insulation. 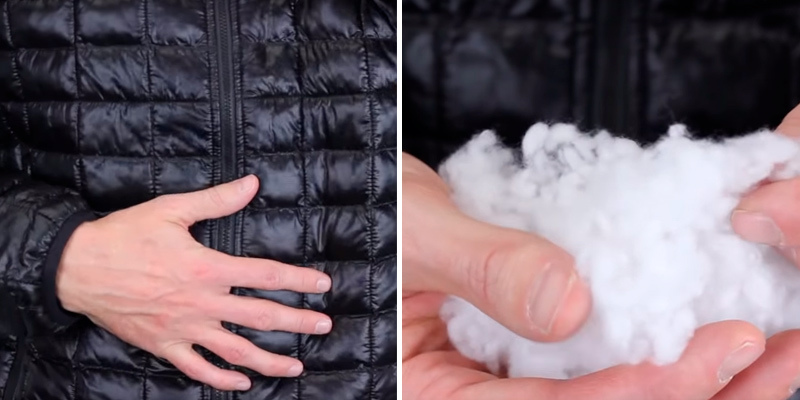 Not only does it ensure a puffy look of a real down coat, but also it makes the whole item as lightweight (about only 12 oz) as a down-filled jacket. Other than that, this unique fill is breathable and you’ll never get overheated. The outer shell is made of 100% nylon with a DWR finish to repel water and moist. The garment design reminds a kind of traditional jacket with a stand-up collar. 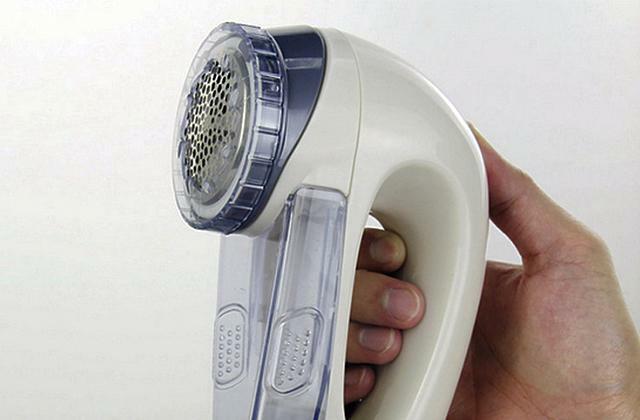 It has a straight cut and natural fit suitable for any body build. 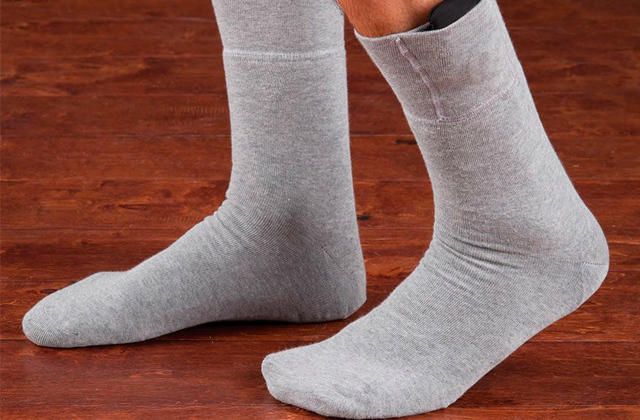 It fits snugly, effectively seals in the warmth, and keeps you warm and comfortable. Besides, a hem-cinch cord allows further adjusting the coat for a customizable fit. This model is offered in regular sizes from XS to XXL for men of different height and constitution. In addition, the jacket can easily compress into a large side pocket for compact storage and handling. All in all, super lightweight, stylish, comfortable, and warm, the North Face Thermoball will find itself a place in your winter wardrobe and make a great choice for casual and technical use under the temperatures that don't fall far below 32 Fahrenheit. If your winters are predominantly snowy and frosty, with many days of especially savage weather when temperatures go far below zero, you know firsthand that a reliable warm winter jacket can become a real lifesaver when you need to go outside and get on with your day. 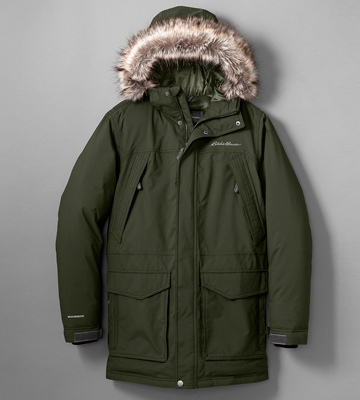 The men’s parka from Eddie Bauer is exactly that type of outerwear. Eddie Bauer, the brand founder, has always been focused on creating clothes that will keep people comfortable and make them go outside, no matter rain or snow. 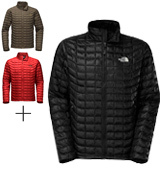 First off, this model stands out for unrivaled weather protection and warmth retention. The 650 premium down insulation certified by Control Union perfectly retains body heat at extremely low temperatures (up to -40°F under moderate activity) and at the same time maintains proper air circulation to prevent sweating and overheat. The 100% nylon outer shell boasts the unique WEATHEREDGE® technology and the StormRepel® DWR finish that ensure superior waterproof and windproof characteristics. The moisture will bead on the fabric like on a waxed surface and the windchill will have no chances to get inside. 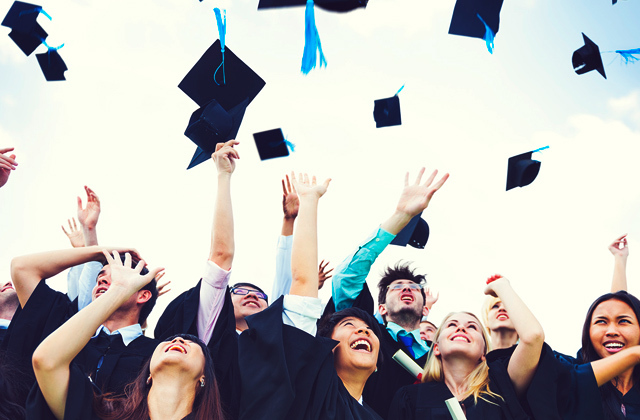 The quality of insulation is not the only factor that determines how warm a jacket will be. Its design also matters. Slightly longer than the majority of classic parkas, this jacket perfectly fits most body types and will protect you from drafts while not limiting your movements. The stand-up collar along with a full-length zip will ensure the cold cannot hit your neck, while the hood and knitted cuffs will deliver functional hand and head protection. Zippered chest pockets are also there and will serve you as an additional hand warmer spot. 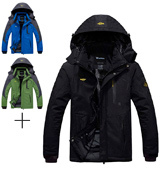 For smaller items and accessories such as gloves, the jacket contains two large lower pockets. 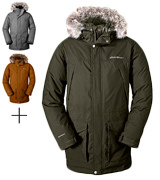 What is notable about this parka is that it's available in a range of sizes, including "Tall", that ranges from M to XXL. This means everyone can find a jacket that will suit them best. Summing up, the Eddie Bauer Parka is an optimal choice for extreme cold and will come in handy for outdoor adventures as well. It will efficiently keep snow, rain, and sleet at bay. Winter sports bring a lot of fun and excitement. Yet, to enjoy skiing and skateboarding to the full, you need not only quality gear but also quality outfit. If you seek a functional jacket for your winter outdoor activities, we've got you covered - the Wantdo men’s ski jacket is exactly like that. 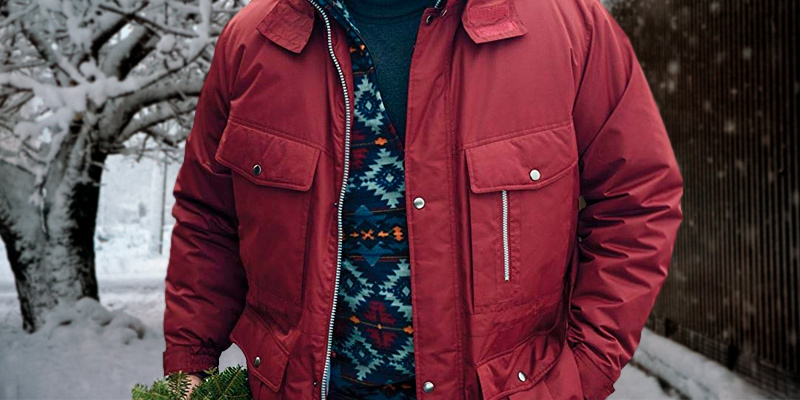 Despite the fact that this coat was originally designed for ski trips, it's perfectly suitable for a variety of other winter outdoor activities - mountaineering, hiking, cycling, skating, running and even fishing - thanks to its highly functional design created around user comfort. The jacket fits close to the body, perfectly seals warmth and doesn't prevent you from moving as you like. 2 zippered hand pockets, a zippered chest pocket, an internal pocket, and an internal secure media pocket will allow you to carry everything you need with you, be it a wallet, mobile phone, keys, or documents. To prevent the warmth from running out and the chill from getting in, the jacket features a snap powder skirt, a hem drawcord, adjustable cuffs, stretchable gloves with thumb holes, and a fleece padded removable storm hood. Made of professional 2400 polyester fabric, the jacket will retain its water-repellent qualities even under 10,000 mm pressure head and protect you from heavy rain and bad mist, while fleece lining will keep you warm and comfy. Two more aspects that can’t be left unnoticed about the Wantdo jacket are the number of color patterns it is offered in and its price tag. 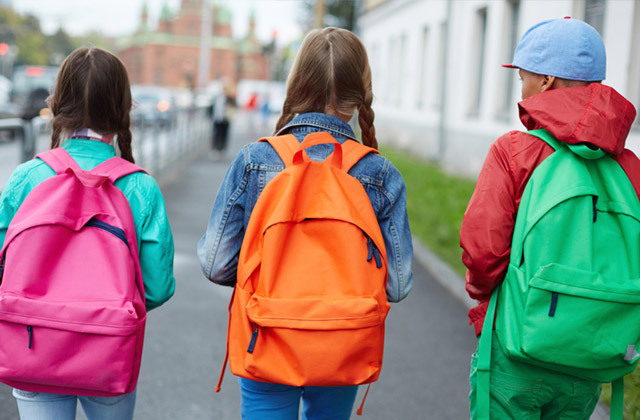 You are free to choose from as many as 7 color designs including moderate black, coffee, khaki, and gray and more bright and vivid blue, red, and grass green. The price tag of this model falls below $100, which makes it a great option for budget-conscious consumers living in the cold regions. 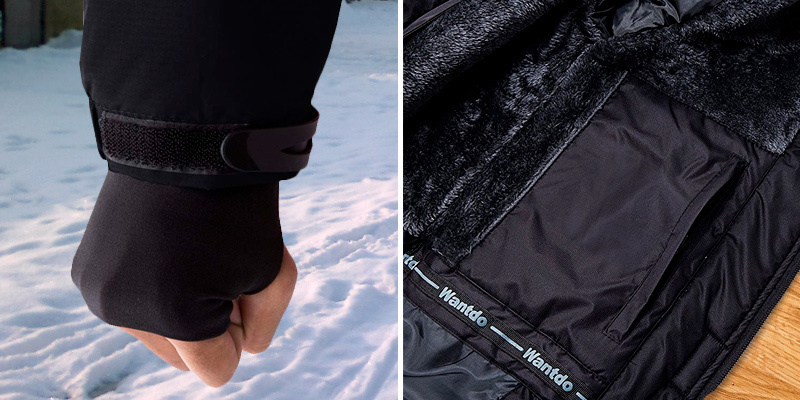 To resume, if you search for a winter coat that won't cost you a lot of money and will deliver the ultimate comfort no matter the weather, the Wantdo ski jacket can be your best pick. For less than $100, it's the best bargain around. Most manufacturers offer winter outwear in a standard size range while there are many men who don’t fit into it. Does it mean taller and bigger guys have no choice? Of course, they have. This is where Boulder Creek outfit will excel, providing a wide choice of garments for king-size men. The Expedition Parka from Boulder Creek is available both in sizes from S to XL and in extra large sizes specifically designed for those whose weight and height fall beyond that standard chart. Moreover, if you are bigger than those accepted average rates, you don’t have to necessarily go for dark or sober colors in clothing. Hence, all Expedition parka sizes are also produced is such eye-catching colors as rich burgundy, pacific blue, and bright orange. 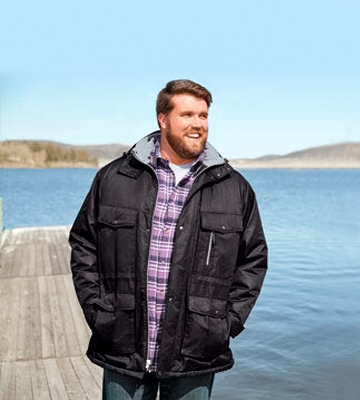 This model is distinguished by a full and tall cut to comfortably fit bigger guys as well as those who prefer their jackets somewhat baggy or want to have enough room for several layers under their winter coat. Considering the jacket design, what you will get is a classic hooded parka with patch pockets and a waist drawcord to create a more streamlined look. A full-length front zip with a snap storm flap, elastic cuffs snugly fitting around your wrists, and a fleece-padded sewn-in hood and a standing collar will trap the heat inside and leave no gaps for it to escape. For added warmth on those colder days, the soft plush fleece lines up the jacket interior from the top to the bottom and the sleeves feature quilted polyester fill. 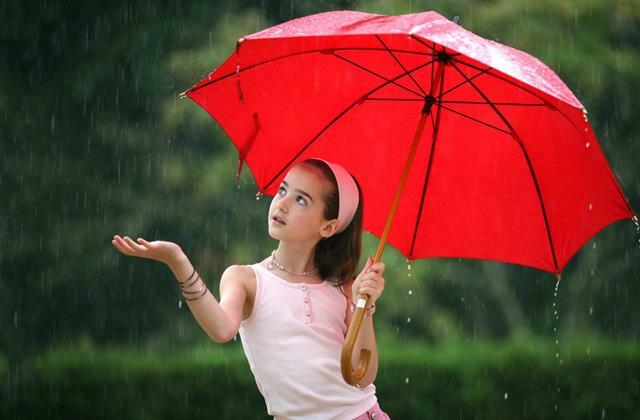 Meanwhile, a synthetic microfiber shell resists water and protects from biting wind. Other than that, it has a kind of membrane effect to ensure breathability. To conclude, no matter what your size is, this practical and truly comfortable parka will keep you warm throughout a winter season and give you a stylish look. If you live in a region with cold winters and need a winter jacket for everyday wear, the WenVen Cotton Parka will fit your needs best. 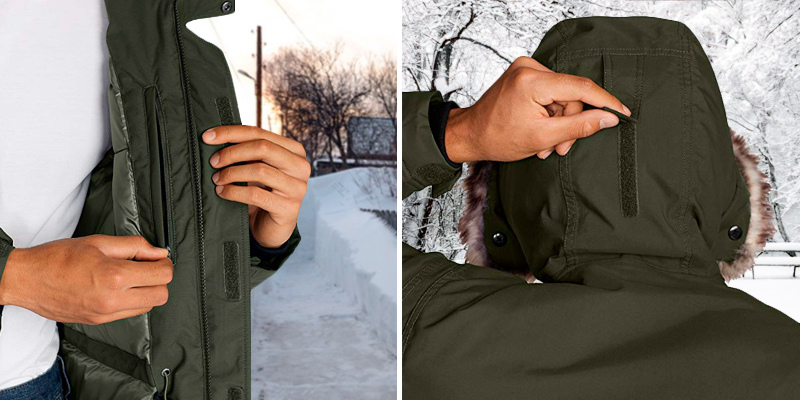 The primary advantage of this parka is that it's both warm and lightweight, which means you won't be restricted in your movements whatever you do. Designed decades ago to be worn in arctic conditions, today parka is a classic piece of clothing that goes with both a casual and business style. The WenVen is not an exception. It offers a regular fit that will fit most body types. Meanwhile, toggled drawcords in the hood, waistline, and hen will let you perfectly customize the shape to your individual build. Patched pockets, along with a covered placket and unique stitching, give the coat an elegant, stylish, and streamlined look. Yet, not only will the WenVen jacket help you create a contemporary and trendy image but also it will keep you warm on those chilly and snowy winter days. Unlike many other cotton parkas not so much suitable for sub-zero temperatures, this model will perfectly fight the cold. All of this is thanks to a well-thought design with a thick fleece body lining and the number of heat sealing details such as a full-length zipper enclosure, stand collar, fleece-lined hood, and knitted cuffs. Drawing a conclusion, what you’ll get is a truly warm and comfortable winter jacket that will be ideal for everyday wear and outdoor activities alike. What Is a Winter Jacket for Men? Quality winter outwear will keep you warm and comfy on a cold season despite the snow and wind. 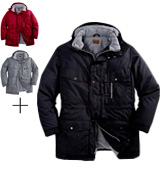 Hence, a good winter jacket is a part and parcel of a winter outfit of those who live in regions with harsh winters. 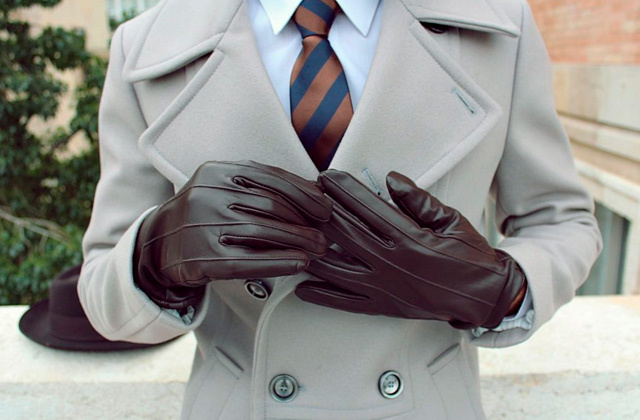 A winter jacket is a piece of garment that will protect you against freezing temperatures and inclement weather. It should have thick insulation to securely shield you from chill and precipitation even when you don't move. Apart from top-level insulation, winter outerwear normally has a number of design features and details to prevent biting wind from sneaking under your jacket. Such features vary from weather resistant outer shells to extra warm inner lining to drawcords in the waist, hem, and hood to snuggly fitting cuffs, etc. 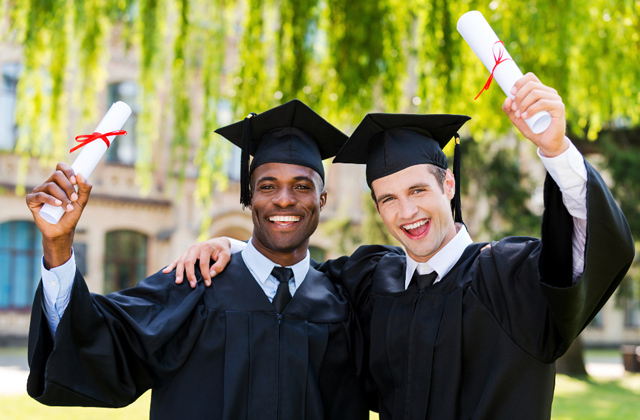 Generally, it depends on the garment style and type. There are basically two major types of winter jackets classified by their intended use. The first type is casual insulated coats for everyday use when commuting to work or running errands around the city. These models are rather focused on style and warmth. The second type is technical jackets meant for outdoor adventures and active pastime. They are designed with an athletic fit in mind and to deliver the ultimate comfort when in motion. 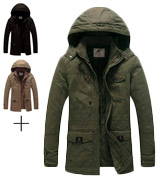 However, the majority of modern technical winter jackets for men can be used in a casual setting as well. It’s all down to your personal style and preference. Whatever your liking, the main points to check when choosing a winter jacket are weather protection and comfort. 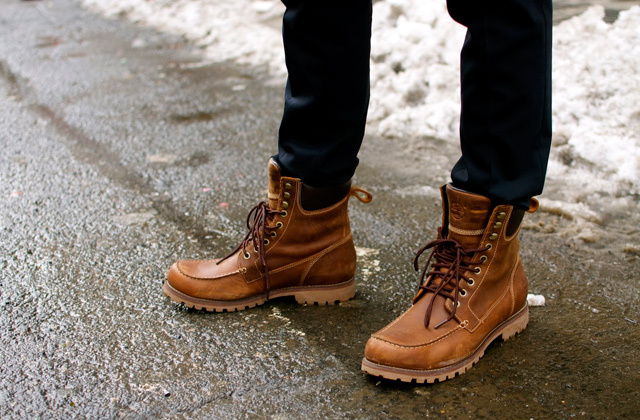 To ensure the ultimate protection from cold and make your winter outfit complete, we also recommend selecting a good pair of winter boots and winter gloves for men.